As autumn approaches its time to get out the winter wardrobe....and what better way to start off the winter season then with some fabulous clothing from Vertbaudet autumn and winter range. We were absolutely delighted to review some of Vertbaudet's amazing items.....As a mother its is important that my children have comfortable yet purposeful clothing that will stand the test of time, especially clothes that keep my children warm and cosy in the forth coming winter months. We were delighted with this amazing 3 In 1 Parka - Grey/Lavender the most amazing thing about this coat is that you can adapt it though the changing seasons, as it has a detachable fleece cardigan which means the parka or cardigan can be worn separately in milder or rainy seasons.... The coat has a reinforced showerproof treatment so its great for those rainy days.......But you can easily join both the cardigan and parka together with the special zip fastenings for a warm parka coat for the coldest of winters.....The coat fastens with a zip and press studs and has phosphorescent piping so your child can be seen during the early evening and dark winter nights. My first thoughts were that the coat was soft and felt extremely cosy and warm inside. I loved the fact we could adapt the coat and also detach the faux fur trim on the hood, My son loved the badge detail on the arm. We adore this coat and its amazing quality. Getting cosy...all wrapped up ready for the cold day's. This 3 In 1 Parka - Grey/Lavender can be purchased from £45 from Vertbaudet. The next amazing product we reviewed were these amazing sturdy Boy's Ankle Boots in Chocolate/Taupe...The boots are padded around the ankle for comfort and are made with strong durable leather...I love the thick rubber soles, and the contrasting coloured panels and stitching as its a really nice touch and makes the boots stand out...The boots have a reinforced toe which is great for my son as normally this is the first area to show signs of wear...I always tend to opt for Velcro touch fastenings on school shoes for quickness so these boot are superb and are available from sizes 7 right up to size 5 which is amazing. 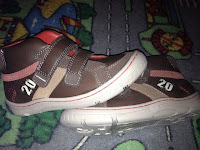 My son has told me that the boots are very comfortable, so much so he has lined them up by the door for school tomorrow....Great Boots for the autumn/winter seasons. 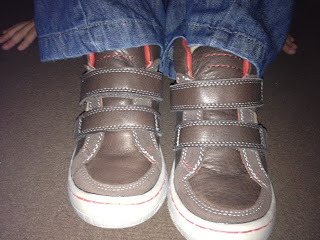 Boy's Ankle Boots in Bright Brown Solid....also available in Grey/Beige/Blue/Black Only £45 from Vertbaudet. Visit Vertbaudet for these items and more fantastic children's/babies and maternity clothing. 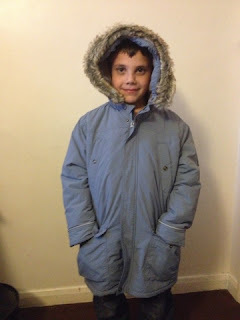 We were given the parka coat and boots to review...All thoughts and are honest and of our own opinion. I really live Vertbaudet but haven't shopped there in a while. I'm going to have to check their Autumn stuff out again!